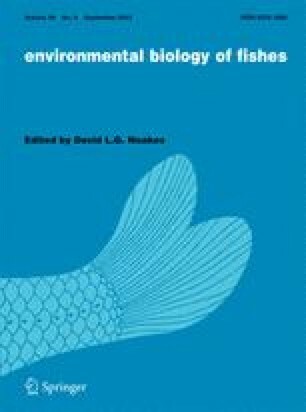 The allocation of energy to growth and reproduction, in relation to temperature and food availability, was investigated in laboratory experiments with the mosquitofish,Gambusia affinis. At constant temperature of 20, 25 and 30°C and ad libitum feeding, specific growth rates increased with increasing temperature at 1.7, 3.1 and 3.4% dry mass day−1, respectively. Growth rates in a cycling temperature regime (20–30°C,\(\bar x = 25^ \circ C\)) were faster than in a 25°C constant temperature. As temperature increased from 20 to 30°C, mean age at first reproduction decreased from 191 to 56 days and brood size and mass of offspring increased significantly. Interbrood interval was also temperature dependent; estimates at 25 and 30°C for females >1000 mg were 22.6 and 18.6 days, respectively. Interbrood interval could not be calculated at 20°C. Although fitness was highest at 30°C, females at 25°C invested a greater proportion of surplus energy (growth and reproduction) to reproduction (38%) than at 20 (17%) or 30°C (36%) during the 32-week study. Fish at cooler temperatures began reproduction at a smaller size.